Located on a small rise about 100 feet south of County Road 18 about half way between County Roads 33 and 35 in Middlebury Township. In recent years this has been kept in good condition, but that could not be said of it in the 1930's, when the grass was cut several times a year with the use of a scythe. Stones copied Aug 8, 1970 by Dean K. Garber. Poll list of election held in the Foster ( later Reifsnyder ) school house in the the township of Middlebury, county of Elkhart and State of Indiana, on the evening of sixth day of January 1855, for the purpose of electing three trustees to receive conveyance for a tract of land for a burying ground in said township and to transact all the lawful l business as such trustees. List of Voters,Thomas Slight, Jacob Ulrick, Jacob G Cooper, John Koonse, F. C. Fracks and Jacob Geisinger. Hereby certified that the number of electors at this amounts to six. It is certified that Isaac Cooper, Thomas Slight and Michael Hoff has each six votes and that are duly elected. That notice by publication in the Goshen Democrat, a newspaper published in Elkhart County, that the above burying ground is called and named "Cooper Burying Ground" . That Jacob Geisinger was chosen clerk of said election. I, Dean Garber, have not found when the name was changed to Geisinger. 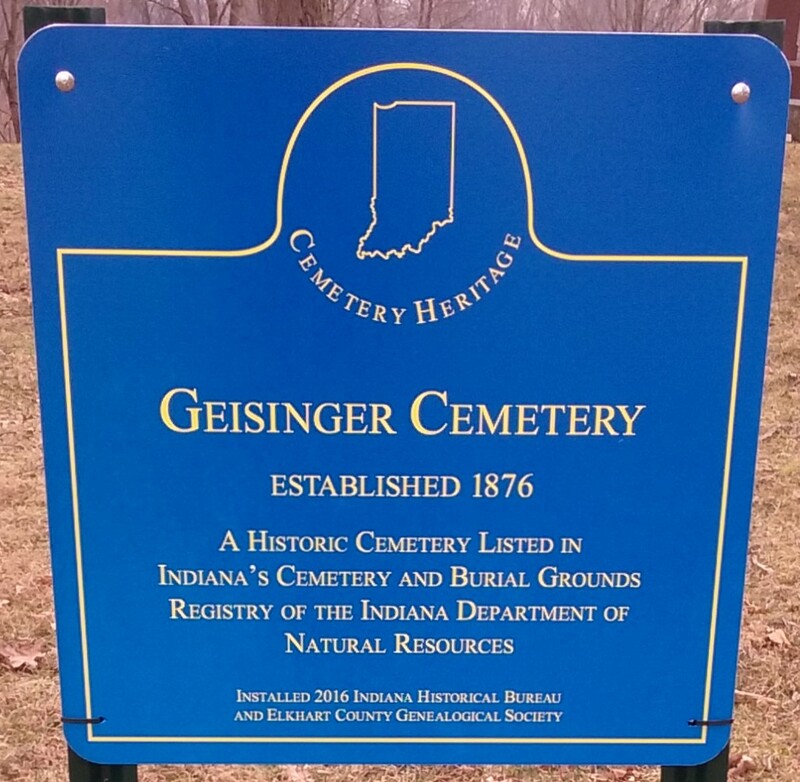 NOTE: Jacob Geisinger was born in Canada and settled on a tract of land situated across the road from this cemetery. His buildings were located back a long lane on the north side of the road and east of the cemetery . It is said that he was a compassionate man. He taught school at the Foster School. Middlebury Township Trustee maintains cemetery.